Botox continues to be the number one cosmetic procedure performed worldwide. Physicians from a wide range of specialties – not just dermatologists but also OBGYNs, primary care practitioners and ophthalmologists – are eager to learn from results-focused educational material written by leading practitioners. Most botox books focus solely on injection technique. Handbook of Botulinum Toxins for Aesthetic Indications: Theory and Practice describes current techniques, but focuses on securing optimum results in different patient types, e.g. patients of different ethnicities, patients with thick skin, heavy brows, and so on. In addition, the book covers hot topics such as the use of new types of neurotoxins, the problem of counterfeit products, and combining neurotoxins with other modalities such as fillers and lasers. 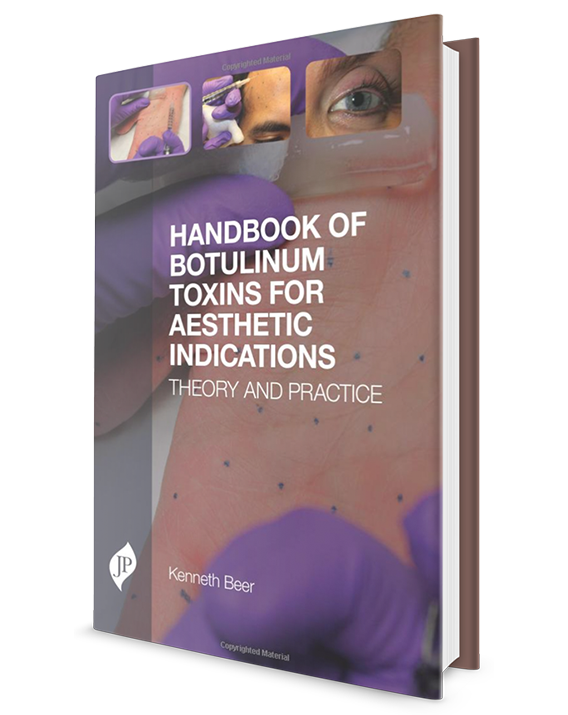 Edited by a recognized educator in this area, and taking a unique problem-based approach, Handbook of Botulinum Toxins for Aesthetic Indications gives practical guidance on the use of different strategies in different patient types to ensure the best possible aesthetic results. Botulinum toxin (BTX) is a neurotoxic protein produced by the bacterium Clostridium botulinum and related species. The goal of this book is to introduce a new generation to this fascinating drug as well as to expand the clinical knowledge of those who are already familiar with them. This book is divided into 11 chapters. First chapter discusses on structure and function of different neurotoxin types. Safety and liability issues of BTXs are covered in second chapter. The aim of third chapter is to introduce different types of injection techniques for forehead and eyebrow shaping. Fourth chapter focuses on the use of neuromodulators in the periorbital region. Fifth chapter focuses on the treatment of the mid and lower face and provides recommendations based upon guidelines from peer-reviewed journals and consensus groups. Sixth chapter aims to describe the role of botulinum toxin A (BTX-A) in the jawline, neck, and décolletage, including the importance of combination therapy with adjunctive surgical and nonsurgical rejuvenation techniques, and the critical challenge of appropriate patient selection. Treatment of hyperhidrosis (HH) of the axilla, hands, feet and other body areas with the help of injection techniques are described in seventh chapter. Eighth chapter aims to describe the concept and technique for reshaping of the lower face. Ninth chapter focuses on the combined application of neurotoxin and multiple laser sources. Combinations of neurotoxins with fillers has been described in the tenth chapter. The last chapter of this book discusses on topical BTX.